I handed a postcard to the young man. He seemed nice, interested in what I had to say. "It's a brand-new program at West Chester University," I explained. "For kids and teens interested in the performing arts." "Oh," he said. "You mean.... so they can grow up to become movie stars?" I get this kind of question a lot. I was thinking about this exchange when I watched a video of a young woman named Samantha Fuentes. In case you haven't seen this clip yet, Sam is a high school student from Parkland, Florida. 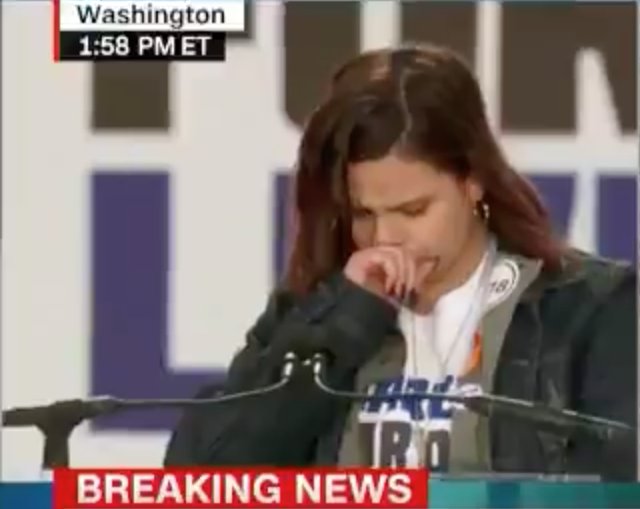 Two days ago, Sam stepped up to the podium at the March for Our Lives, in front of 50,000 people, to deliver a speech on gun control. She took a deep breath. Began her speech. And then she promptly threw up on international television. I have been a theatre teacher for many years now, and while puke isn't the first thing that comes to mind.... well, let's just say there hasn't not been puke in my experience as an educator. There have also been tears. Sweating. Shaking. Wide-eyed, dead-stare, paralyzing panic. And yes.... puke: backstage, before a show, after a show, while rehearsing for a show, and once, memorably: onstage, directly into a piece of scenery. It happens. And this might seem obvious, but is worth stating: it happens because we are afraid. It happens because fear of public speaking is continually atop every list of "Most Common Fears." Across ages, races, countries of origin.... when people are surveyed, the number one fear in the world is the fear of standing up and speaking in front of others. I mention this because it is what we tell our students, before they perform. Across all ages, and races, across gender and religious identities, across all spectrums of students we have encountered, that same queasy, nauseous look is universal. We know that fear when we see it. And that's when we remind ourselves, and one another: this fear is completely normal. And no matter what happens out there.... even if you forget all your lines or fall off the stage or the worst, most embarrassing thing that you can imagine happens... just by taking a deep breath and walking out there, you are already so very brave. I think a lot of that fear comes from worrying that the audience will laugh at you, or reject you. But when watching that clip of Samantha, I was struck by how the crowd wasn't grossed out. They didn't boo, or turn away in disgust. They started clapping, and cheering. Cries of "You got this," or "Go, Sam" began to ring out. Being afraid -- having that fear of standing up and speaking up -- that's normal. Conquering that fear makes you brave. Makes you extraordinary. Samantha Fuentes threw up on national television. Then she stood up, laughed, made a joke about it, and continued her speech. If the shrapnel in her leg wasn't bravery enough.... this is one of the bravest acts I've ever seen. Most of our students won't speak in front of thousands of people. Most of our students won't become movie stars. And that's okay. That's normal. Most of us don't want those things. But all of us, at some point in our lives, will encounter that fear. And if I can do one thing as an educator, it's to remind young people that this fear is normal. And teach our students how to breathe through it. How to recognize that fear, and how to move past it. How to stand back up and keep going. No matter what happens. It's what you do with that fear that makes you brave. Hey everybody! Katherine here. For those that don't know me, I'm the design teacher and the managing director here at PTI. I'm writing this blog post to keep everyone updated on the big news, which is that we can't wait to tell you all about our amazing new summer camp programming at West Chester University, launching Summer 2018! There are other places on the website that will tell you who we are, and what we're all about, but I figured it might be nice to tell you why we decided to bring PTI into existence. In short, Pennsylvania Theatre Institute at WCU is an opportunity that we simply couldn't pass up. We worked together for years at a summer camp that we loved, teaching kids that we adored. It felt like such an honor to watch them grow up, year after year, and while we all love our careers in the professional theatre world, we each looked forward to this job all year long. Charlie D, our camp director, is a good friend... but he's an even better boss. He spends an insane amount of time and energy making camp a special place, and we all benefit as a result. When we learned that West Chester University was interested in starting a summer camp program and they wanted Charlie to run it.... well, we all jumped on board when he called. We just couldn't imagine spending our summers with anyone else, doing anything other than teaching students together. We definitely feel bittersweet about saying goodbye to our last camp -- it was a really special place, with incredible colleagues, students, and friends -- but we also knew this was a big opportunity. While our last camp was deeply special to all of us, we know that we're going to make something wonderful in our brand-new home. One of the biggest things we're excited about is developing our Pre-College Intensive program. For years, we've been building curriculums in exciting ways with our younger students, and now we have the opportunity to dive deeper into more intensive exploration with our teens. For our younger campers, we're so pumped to test out new ideas with new students. Some of our lesson plans have been honed to perfection over the years, but we've also come up with great new ideas for how to make our Young Company camp unique. We'll try to keep this blog updated as we leap into the unknown with this project. In the meantime, wishing all a safe and happy holiday. (And hey! If you're so inclined, feel free to follow us on Facebook, Instagram, or Twitter! We will try to keep it fun, or as fun as we can muster without the students on campus yet).